« From $389,900! New Surrey Clayton Cove Rowhomes by Lakewood Now Selling > Only 5 Available! PRICED FROM JUST $199,900! A revolutionary Surrey City Centre real estate development is coming soon! Introducing the highly anticipated and sought after Surrey University District condo tower by BOSA, a trusted and very experienced Lower Mainland builder (one of our favourites!). With Surrey City Centre being transformed very rapidly into a commercial, retail and residential city core, the new University District Surrey condo tower will be located in a prime location close to some of the most amazing urban amenities, services, mass transit systems and recreational opportunities. From the new Simon Fraser University Surrey Campus to the new Surrey Memorial Hospital and from Holland Park urban green spaces to the new RCMP Headquarters, the preconstruction Surrey condos will be one of the most highly sought after condominium residences in the area. Not only is business investment growing, but with strong employment, new residential homes and one of the fastest growing communities, the new University District Surrey City Centre condos is the project to beat when it comes to value, presale pricing, opportunities, interior finishes, floor plans and of course, views. According to the BOSA CEO, the developer is launching BosaSPACE in Surrey City Centre, a completely ground breaking and revolutionary concept for a new condo. These University District Surrey condos are intelligent, responsive and unlike anything that you’ve seen in this market place. Not only will they change your perspective on city condo living, but they will also feature smarter innovations that are healthier and more liveable. The intelligently designed floor plans and interiors make for MORE SPACE at a MORE AFFORDABLE price point. The BosaSPACE at University District Surrey condos is a new concept that drastically changes the reality of condominium living, especially in a high-rise tower. Your entire home here at the new BOSA BosaSPACE Surrey condos is responsive, giving you more living space than you ever dreamed possible! Situated in the heart of Surrey City Centre, residents here will live just steps away from the new library, new City Hall, SFU Surrey Campus, the SkyTrain and Surrey Central City Shopping Centre. These unbelievable deals start from just $199,900! In addition, there are 200 homes at University District Surrey preconstruction condos priced under $350,000! The BosaSPACE University District condo location is at the corner of 104th Avenue and University Drive Surrey City Centre. The most current marketing from the developer reads: Introducing the world’s most intelligent living spaces. They’re as smart as your phone, as big as your life, and they’re coming to University District in Surrey City Centre this Fall. You need to see them to believe them. The world’s most intelligent living spaces come to Surrey City Centre. Homes as smart as your phone. Condos as big as your life. Responsive, revolutionary — and coming to University District Surrey this Fall. Many condo buyers are looking for on-site building amenities when searching for their new home. We’re pleased to announce that the new Bosa University District condos in Surrey City Centre will offer amazing resort inspired amenities that includes a state of the art gym which opens onto a very large roof terrace deck. There are also modern change rooms for men and women. The high-rise tower community will also feature a Zen yoga pavilion that will be surrounded by professionally designed and landscaped relaxing water features and greenery. The preconstruction Surrey University District condos will also have a guest suite and a professional boardroom and work offices so that you can do some work from your own home (if needed). Other amenity spaces include an entertainment lounge that will offer a double sided fireplace, designer kitchen and separate movie screening room. It’s a great place for relaxing with friends or entertaining small to large gatherings. The preconstruction Surrey University District condos will also have an impressive rooftop terrace that has reflecting ponds and BBQ facilities for outdoor enjoyment. Starting prices include 1 bedrooms from $199,900 and two bedrooms from $299,900. The deposit structure is 5% upon writing, 5% in 60 days, 5% upon amendment to the Disclosure Statement and 5% three months after the 2nd deposit. Please note that these details are subject to change at any time. The estimated completion date is for late 2016. The dynamic Surrey marketplace will welcome a landmark project in the coming months! Located in the heart of Surrey City Centre district, Bosa Properties will be launching a 35 storey landmark high-rise (including sub penthouses and penthouses) to 104th Avenue and University Drive. If you haven’t heard about it, we introduce you to the new Surrey University District condo tower, offering 310 homes for sale less than 1 block from the Surrey Central City SkyTrain Station on the Expo Line that will get you to all points within the Lower Mainland within minutes! In addition, as the name suggests, new Surrey University District condo owners will be just 7 minutes walking distance from the brand new and very exciting Simon Fraser University Surrey District, which was recently named as Canada’s top comprehensive university for the 5th year in a row by MacLean’s magazine! But that’s not all! There are also top ranked schools for all ages within minutes of your front door in addition to a plethora of community amenities that include the new Surrey Public Library, the new Surrey City Hall and tonnes of recreational options. These include the Trevor Linden Fitness Centre and Chuck Bailey Rec Centre in addition to many parks like Bear Creek Park and Holland Park to name a few. As well, lots of shopping and dining options are nearby including Surrey Central City Shopping Mall with both big box retailers as well as boutique stores. There’s also Guildford Town Centre with it’s upcoming launches for Sephora, Victoria Secret and Aritzia too. Whatever community amenities you are looking for, you’ll definitely find in and around the preconstruction Surrey University District condo location. Coming soon to the heart of the Surrey City Centre neighbourhood, University District Surrey condos by BOSA Properties will be a dynamic, ground breaking and affordable opportunity for home buyers to purchase in one of the most exciting and ever changing communities in the Lower Mainland. This is the first of several residential condominium towers that BOSA is currently planning to bring to the Surrey City Centre real estate market. Therefore, home buyers who purchase at the upcoming Surrey University District condo tower can get into a ground level opportunity before prices are expected to head higher once the neighbourhood is complete. The future of Surrey is one of growth and evolution and with over 1,200 people moving into the city per month, now is the perfect time to purchase a brand new University District Surrey condo. The University District Condos by BOSA will be located at 104th Avenue and University Drive Surrey just opposite the new Surrey City Hall and just five hundred metres from the SkyTrain Station. This transit oriented Surrey community at University District by BOSA will offer a total of only 310 condominium residences ranging from junior 1 bedroom suites to large two bedroom homes. The presales are expected to start in Fall 2013 with prices starting from $199,900 and over 200 presale Surrey University District condos priced under $350,000! The grand opening celebrations will take place in November 2013. Experience the future of condominium living in City Centre, just steps away from the new Surrey Library, SFU Surrey, SkyTrain Stations and Central City Shopping Centre. More information is online at http://ud.bosaproperties.com/. Bosa Properties is coming to Surrey! Steps away from the new SFU campus, City Hall and Library, the new Surrey University District by BOSA condos is situated in the most exciting neighbourhood in the Lower Mainland. 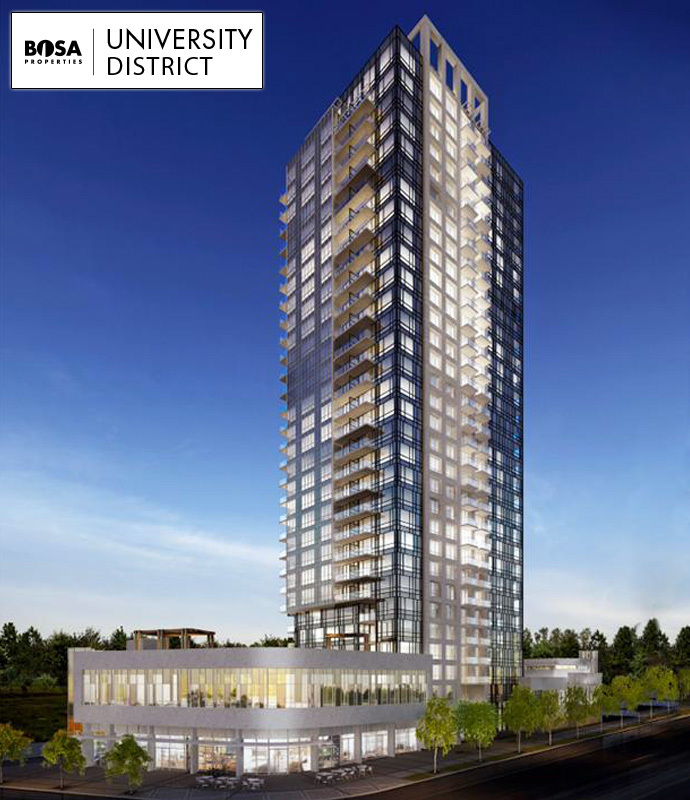 The University District Surrey condos will be located in the heart of Surrey Central City. This is smart living. Bosa Properties is coming to Surrey this fall. Just steps away from the new SFU campus, City Hall and the Bing Thom library, University District is helping to reshape Surrey City Centre. We’re rethinking how to live in a 21st century city – what about you? Register to hear more about University District. The new City Hall will be home to thousands of city employees – the centrepiece of a revitalized downtown for Surrey. University District will enjoy the fast-growing choice of shops, stores and services catering to big local workforces, such as Coast Capital and the RCMP. Did you know that over 7,500 students are attending SFU Surrey – and that there were four applicants for every seat! Close by is the futuristic Bing Thom library – a wonderful civic amenity. Almost 1,200 people every month are moving to Surrey. Now is the time to seize your opportunity to get a seat right at the heart of it all. Projections show that by 2041, the city’s population is expected to grow to 740,000, making it as big as Vancouver.